Stick ice cream machine is used to make ice creams with a stick with various flavor. The syste-m may produce variety of ice cream whose surface is smooth, which has good taste with special flavor. This good-quality device is convenient to operate regulate, By using different apparatuses for grouting paste, one can change the sort of products quickly produce many kinds of ice cream with stick, with chocolate coating or without ice cream. The series multipurpose ice cream machine which is designed, made in accordance with your requirements will contribute to the rise in quality of ice cream to satisfy customer need. Capacity from 3000---6000pcs/hour, 8000---12000pcs/hour, 15000---18000pcs/hour can be choice. 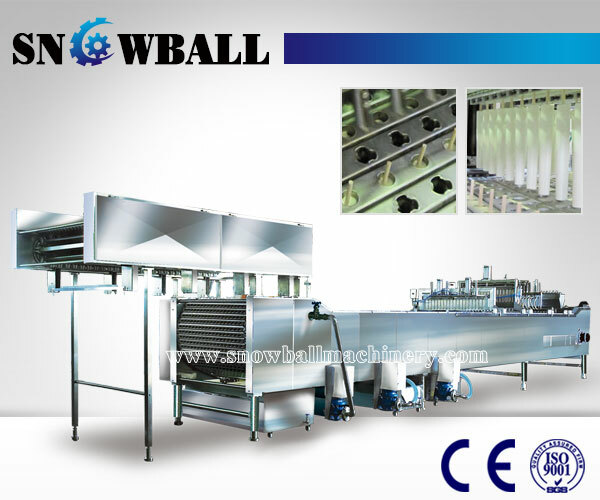 The most common manufacturers of these equipments are CATTA 27, GRAM, HOYER, SIDAM, TECHNOGEL, TETRAPAK, WCB ICE CREAM. 1. Highly efficient, energy saving.